More than 100 people chanted and sang outside a Justice Department building in Washington, D.C., on Friday. 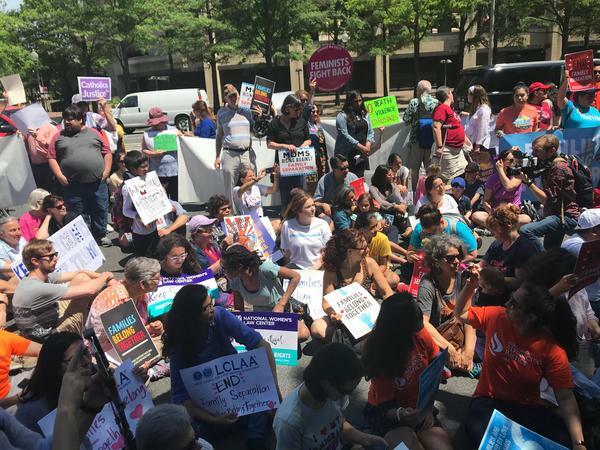 The protesters gathered to condemn the Trump administration's practice of separating immigrant parents and children at the Southern border. Jessica Morales Rocketto organized Friday's protest in Washington, D.C. Protesters gathered Friday in Washington, New York City, Miami, Atlanta and other cities. 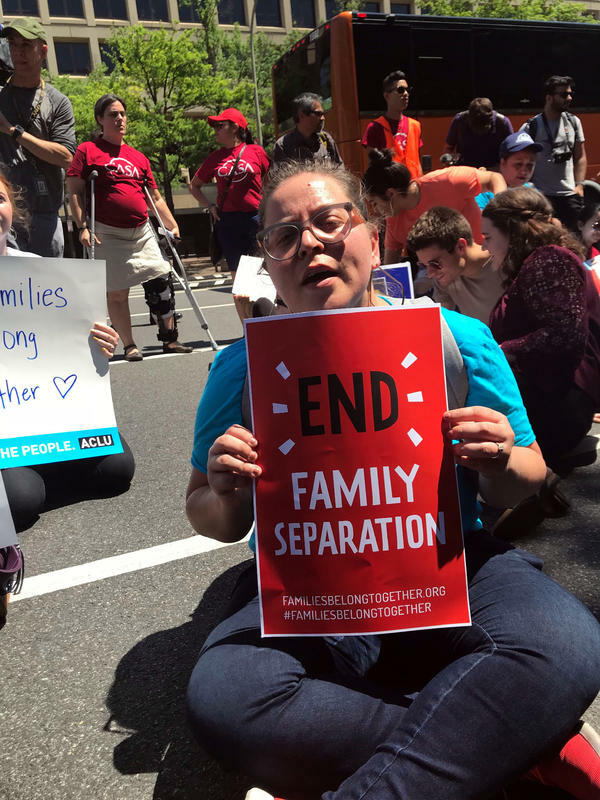 Protesters gathered in more than two dozen cities across the country on Friday to condemn the Trump administration's practice of separating immigrant parents and children at the Southern border. At least 600 children were taken from their parents last month as part of the administration's crackdown on illegal immigration. "The stories are horrific," said Jessica Morales Rocketto, with the National Domestic Workers Alliance, who helped organize the protest in Washington, D.C.
"It's like, babies being ripped out of their mothers' arms — literally ripped out of their mothers' arms. It's horrifying ... that is happening in America. And we can't rest until it stops happening," Morales Rocketto said. More than 100 protesters chanted and sang outside a Justice Department building in Washington. Cathy Schneider, who teaches at American University, felt compelled to join the protest. "I don't recognize this country," Schneider said. "And I can't imagine how any American is not appalled by this." The goal is to discourage immigrants from crossing the border illegally. The Trump administration has considered separating parents and children as a deterrent since last year. And last month, Attorney General Jeff Sessions made it clear: Families that cross the border illegally will be separated. "If you don't want your child to be separated, then don't bring them across the border illegally," Sessions said in Scottsdale, Ariz., last month. The Justice Department says family separations are necessary because children can't go to jail with their parents. So they're placed in shelters run by the Department of Health and Human Services, while their parents face charges — in most cases, a misdemeanor charge for illegal entry. This is a big departure from past practice. Previous administrations tried to keep parents and children together in family detention centers, or released them into the U.S. to wait for their immigration court dates. Homeland Security Secretary Kirstjen Nielsen continues to defend the new policy. "We will refer 100 percent of illegal Southwest border crossings to the Department of Justice for prosecution," Nielsen said at a press conference near the Southwest border in Nogales, Ariz., on Thursday. "In communities across this country, if you commit a crime, the police will take you to jail," she said. "It should be the same on the border." But critics say this isn't really about law and order. They say separating immigrant families is cruel and immoral. Many of the people crossing the border are fleeing from violence and lawlessness in Central America and are seeking asylum in the U.S.
"This is not who we are as Americans," said Rep. Joaquin Castro, D-Texas, at a protest Thursday night in San Antonio. "Your presence here tonight is a signal back to Washington," Castro said, "that just because somebody crosses a border, doesn't make them nonhuman." Protesters gathered Friday in New York City; Santa Monica, Calif.; Miami; Atlanta and other cities. And they held a protest last night on the steps of the county courthouse in El Paso, Texas. Immigration lawyers in this West Texas border town have been saying for months that they saw families separated, long before the Trump administration's "zero tolerance" policy became official. "For weeks or months, they'll go without knowing where their kids are, or without being able to talk to them," said Linda Rivas, executive director of the Las Americas Immigrant Advocacy Center in El Paso. Even when parents have served their time for illegal entry, Rivas says, they're often placed in immigration detention without their children. "It just ends up being a very helpless situation," she said. Immigrant rights advocates aren't just protesting. They're appealing to the Organization of American States to put pressure on the Trump administration. And they've asked a federal court in California to step in and stop these family separations. They're still waiting for a ruling. Protesters are gathering in more than two dozen cities across the country to condemn the practice of separating immigrant parents and children at the southern border. At least 600 children were taken from their parents last month. NPR's Joel Rose brings us this next report. JOEL ROSE, BYLINE: A few hundred protesters chant and sing outside a Department of Justice building in Washington today. UNIDENTIFIED PROTESTERS: (Singing) Across every border, I'm going to let it shine. ROSE: Jessica Morales Rocketto is with the National Domestic Workers Alliance. She helped organize the protest against the Trump administration's zero tolerance policy that's led to the separation of immigrant families. JESSICA MORALES ROCKETTO: The stories are horrific. It's, like, babies being ripped out of their mothers' arms - literally ripped out of their mothers' arms. And I just - it is just horrifying to me that this is happening in America. And we can't rest until it stops happening. ROSE: The protesters included Cathy Schneider, who teaches at American University. She felt compelled to register her objection. CATHY SCHNEIDER: I don't recognize this country. And I cannot imagine how any American is not appalled by this. ROSE: The goal is to discourage immigrants from crossing the border illegally. The Trump administration has considered separating parents and children as a deterrent since last year. And last month, Attorney General Jeff Sessions made it clear. Families that cross the border illegally will be separated. JEFF SESSIONS: If you don't want your child to be separated, then don't bring him across the border illegally. It's not our fault that somebody does that. ROSE: The Justice Department says family separations are necessary because children can't go to jail with their parents. So they're placed in shelters run by the Department of Health and Human Services while their parents face charges. In most cases, it's a misdemeanor - illegal entry. This is a big departure from past practice. 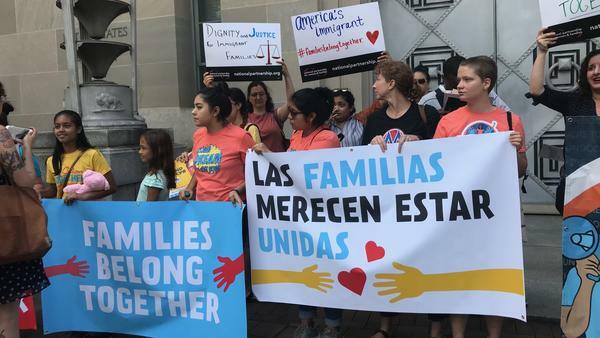 Previous administrations tried to keep parents and children together in family detention centers or released them into the U.S. to wait for their court dates. Homeland Security Secretary Kirstjen Nielsen continues to defend the new policy. Here she is yesterday at an appearance near the border in Nogales, Ariz.
KIRSTJEN NIELSEN: We will refer 100 percent of illegal southwest border crossings to the Department of Justice for prosecution. Every day in communities across this country, if you commit a crime, the police will take you to jail. It should be the same on the border. ROSE: But critics say this isn't really about law and order. They say separating immigrant families is cruel and immoral. Many of the people crossing the border are fleeing from violence and lawlessness in Central America and seeking asylum in the U.S.
JOAQUIN CASTRO: This is not who we are as Americans. This is not what we stand for. ROSE: This is Democratic Congressman Joaquin Castro speaking at a protest last night in San Antonio. CASTRO: Your presence here tonight is a signal back to Washington, D.C., that just because somebody crosses a border doesn't make them non-human. ROSE: Protesters gathered today in New York, Santa Monica, Miami and Cleveland and last night on the steps of the county courthouse in El Paso, Texas. LINDA RIVAS: Good evening, everyone. Thank you so much for being here. ROSE: Linda Rivas directs the Las Americas Immigrant Advocacy Center. She's seen families separated in this border town for months even before the Trump administration's zero tolerance policy became official. Even when parents have served their time for illegal entry, Rivas says they're often placed in immigration detention without their children. RIVAS: For weeks, if not months, they'll go without even knowing where their kids are or without being able to talk to them. And it's just - ends up being a very helpless situation. ROSE: Immigrant rights advocates aren't just protesting. They're appealing to the Organization of American States to put pressure on the Trump administration. And they've asked a federal court in California to step in and stop these family separations. They're still waiting for a ruling. Joel Rose, NPR News. Transcript provided by NPR, Copyright NPR.